Back on the dirt we got to spend lots of time with two of our best friends, Debbie and Karen, and a Cabbagetown treasure, Ronnie Edwards. Earlier this year, during our first trip to the Bahamas, I found it a little hard to adjust to life on the boat. When we would watch TV episodes on DVD in the evening, I would devour the details as Jill would open a glass cabinet door, remove a coffee mug, and set it on the counter. I felt envy as she walked through her living room and out the back door to talk to Wilson over the fence. She had a house that didn’t sway and an outdoors she could visit any time and walk around in. Gradually my thoughts started to turn to the cabinet doors and neighborhood we left behind. Although, I loved the idea of our life on the boat, I started thinking about how I could transfer some of the things that most interested me about sailing to life on land. I had been reading about sustainable cooking and imagined building a community oven in the Cabbagetown community garden. I thought about the friends whom I could engage to help and what it would take to get such a project off the ground. Since our house is rented out for two years, I considered where we might live if we moved back and how we could pay the bills. Thoughts of home were constant in my mind. A dark weight pressed down on my head. I was homesick. 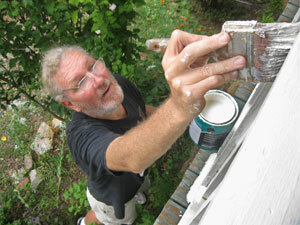 We made money over the summer and fall doing odd jobs and one really big job, painting Karen’s house. I tried telling Greg how I felt. I told him I didn’t think I could do it anymore. He didn’t really get the drift of what I was saying. He had fallen in love with sailing. He never wanted to go back. I tried to adjust my thinking to make sailing work for both of us. Maybe if we only did it for half the year â€“ spent 6 months on land. Maybe if we get someone to help with big crossings, so I could be sick without worry and Greg wouldn’t be sailing alone. Eventually the homesickness started to ebb a little. 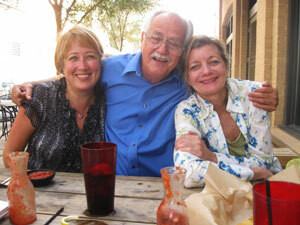 Our friends from Cabbagetown, Debbie and Karen, visited and we had a great time. We started making plans to return. I thought about how good it would be to sleep in my in-laws guest bed when we got back to Stuart. We found some good seasick medicine and it worked. I felt almost better than normal on our sail back across the Stream. We made it back to Cabbagetown the first week of July. It was great to see friends and family. We had planned to stay with our friend Debbie through the summer and fall while we did some work on our house and tried to make some money. That first weekend we went to Greenville, SC to cat sit for our friends David and Michelle. This was the third house and bed we had slept in the 3 weeks since we had been back and it was here I started dreaming of water and boats. I began imagining Greg and I securely in the cabin of Blue Wing swinging at anchor in Bahamian waters of Tilloo Cay. I was homesick again, but this time what I was homesick for was on stands, tucked away in a row among many rows and rows of other boats all silent and still, propped up on the dirt. We were homeless. One of the best things about our Cabbagetown home is all of our amazing friends and their amazing creativity and love of community and fun. 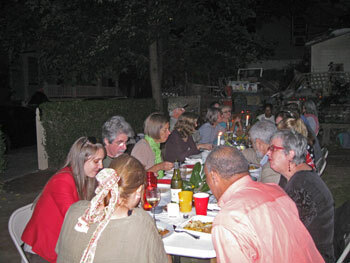 Our friend Jeane threw us this wonderful impromptu going away pot luck dinner in Cabbagetown’s Whisper Garden. Greg and I decided not to stay in Cabbagetown as long as we planned. I was uncomfortable with the idea of being homeless and living with someone else. I thought it would be better to be in our own space at Greg’s parents second house in Florida. But before we got a chance to head back an opportunity arose. A friend asked us to house/cat sit for her for two weeks. This started a tour of Cabbagetown as we moved from street to street, watching cats, dogs, and fish for various vacationing friends. We even got to house sit for our renters in our own house. Just as earlier this year we learned how to live life at sea, this past hurricane season we learned to live life again on land. We found we could be a part of the community without having a residence. Being homeless in Cabbagetown was not so bad. Now that we are back on the boat and are continuing the watery part of our adventure, we are taking our home with us, and at the same time leaving a little home behind. I am prepared for the possibility of homesickness again, but I also know that our bunk in Blue Wing’s v-berth is the best bed I have slept in all year. Hi, Good to hear from the sailors again! Have a great winter and send words and pictures for us to vicariously enjoy.